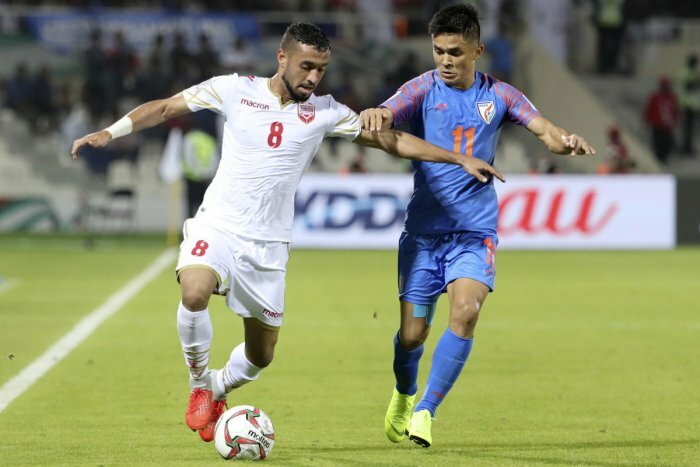 India crashed out of the AFC Asian Cup with a heartbreaking 0-1 defeat at the hands of Bahrain, who scored in the injury time, in their final Group A match, in Sharjah, on Monday. Bahrain converted a penalty in the 91st minute through Jamal Rashed, who made no mistake after India captain Pronay Halder committed a careless tackle inside the box. India finished outside the top two after the the group's other game between UAE and Thailand ended in a 1-1 draw. Entering their final group game following a 4-1 win over Thailand and a 0-2 loss to hosts United Arab Emirates, a determined India held on for 90 minutes before conceding. This was India's fourth appearance in the continental showpiece, beginning with the 1964 edition, in which only four teams participated. In their next Asian Cup in 1984, India were knocked out in the first round and they suffered a similar fate in 2011, when they lost heavily to Australia, South Korea and Bahrain. However, the team under coach Stephen Constantine started the tournament with a demolition of Thailand, sounding a warning that it was not here to make up the numbers. They were a shade unlucky against UAE and went down fighting, but looked determined against Bahrain. The Blue Tigers started off shakily after losing defender Anas Edathodika to injury as early as the second minute, but Sandesh Jhingan and his colleagues managed to stave off the Bahrain strikers until the blunder inside the box.